It's Time to Inculcate the Habit of Skillful Reading -- Gear Up For the Read Across America Day! Hey, you lovely people! February has indeed been a great month with festivities and celebrations galore. Well, as always, we plan things way in advance, and so we’d like to introduce you to a festival that commemorates the act of being learned and erudite. In fact, if you think deeply, this festival preaches essentially what we like you to do. Guesses? Yay! You guys have mastered the act of being well-informed – I am indeed talking about the Read Across America Day! Read Across America Day is a gala event that calls for people to all groups, especially young sweet kids, like you, to come together and participate in Marathon reading. Every year on the 2nd of March - Dr. Seuss' birthday - National Education Association conducts the Read Across America Day to encourage children to read and come out as learned and educated individuals. Getting to the root of this Day, we will dive into finding relevant facts that make this event so memorable and gratifying at the same point in time. Historically, the Read Across America Day is celebrated to commemorate the birthday of the beloved Children’s books author Dr. Seuss. He was extraordinarily popular for penning down some of the most well-known books for young readers. In fact, his writings were so famous that by the time of his death in 1991, he had sold over 600 million copies, some of which were being translated into more than 20 languages! Now, that’s huge, isn’t it? Let us know a little more about this legendary author to understand the reason to his high stature. Dr. Seuss is the pen name of Theodor Seuss Geisel, who was an alumni of Dartmouth College, Oxford University. Starting off his career as a cartoonist and illustrator, Dr. Seuss went on to become a full-time author specializing in Children’s literature. What makes him so unique; you may ask, and why is he still lauded even after he was born over a century ago. Well, we have an answer for that, a very valid answer, in fact: Dr. Seuss changed the landscape of children's books with his controlled-vocabulary tales (read: simple language) of antic cats (The Cat in the Hat), colorful meals (Green Eggs and Ham), and dozens of other zany or crazy insane tales that took inspiration from austere and non-ornamental facets of our life. One thing we can certainly derive from Dr. Seuss's works - plain and banal things were given their due, and he reiterated the importance of staying happy and finding happiness with the mundaneness of life. When Dr. Seuss set out to write The Cat in the Hat, he wanted to write a story that used simple, mostly monosyllabic words that readers could readily comprehend. His use of the patterned, rhyming text has become the foundation for many controlled-vocabulary texts for young readers. This was the story of a man who received a lot many posthumous (time to get your dictionaries, sweets) recognitions including the renaming of the University of California, San Diego's University Library Building Geisel Library in honor of Geisel and Audrey (his wife) for the generous contributions that they made to the library and their devotion to improving literacy. 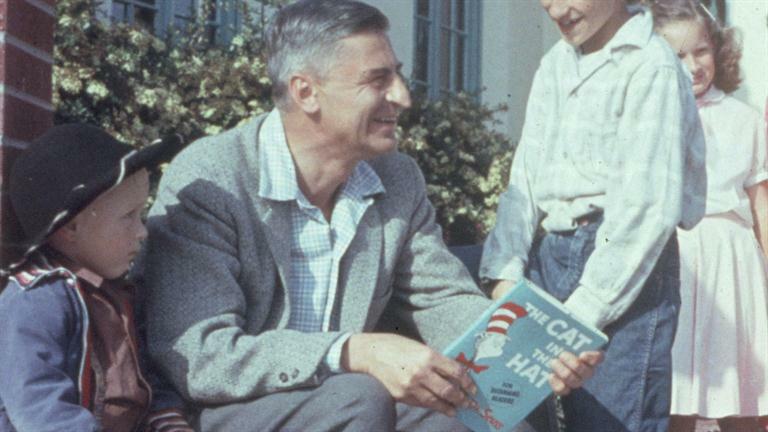 Later in the next few years, the Read Across America Day was celebrated in his memory so as to celebrate his outstanding contribution to young children's writings. We all know that our country has a rich lineage of some amazing authors, writers, novelists and poets who have left us a goldmine of literary treasure. We think that this Day gives us an opportunity to leave all things behind and instead, give way to hone our reading skills, which is something that will earn us good all through our lives. And the best part – you don’t require to read only those hefty encyclopedias or texts books, you can read just about anything and still help yourself inculcate this habit. A knowledgeable person is a gem of their country and with a great heritage like ours, it's only mandatory that we instill good values in our offspring to grow up into healthy, knowledgeable youth who will go ahead and add many more feathers to a nation as great as America. We, at Best Brains, are driven by an aim to raise lovely kids like you into great beings. Hence, we totally promote and encourage activities for the Read Across America Day because it significantly meets up to our endeavors in making you smarter, sharper, more prosperous and righteous humans. So kids, get up and get going, here's your chance to become a model to your friends as you pick up a book epitomizing the essence of good reading and learning! Here's wishing and encouraging you all to become a part of this noble deed and be the great future that America deserves!